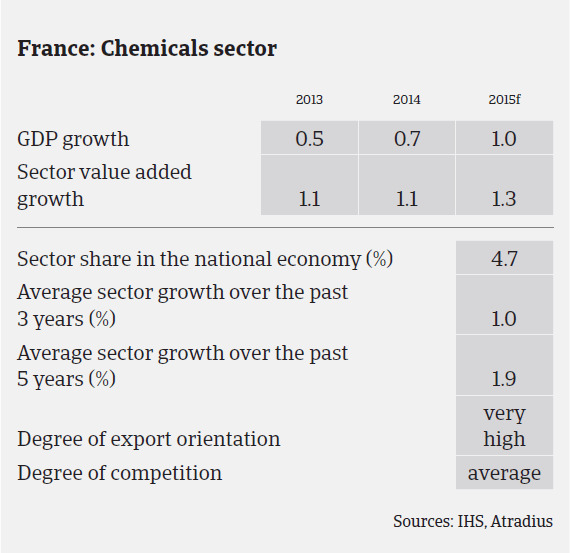 The French chemicals sector has proved to be resilient in recent years, despite the feeble growth rates of the French economy. According to the French chemicals association UIC, French chemicals production is expected to grow 2% in 2015 after a 2.9% increase in 2014. Looking at subsectors, mineral chemicals, which is linked to the industrial gas and fertilizer industry, grew 0.9% in 2014 and is forecast to increase 1.2% in 2015. Soap and perfumes, which are niche markets and benefit from the experience of French businesses, grew 3.9% in 2014 and are forecast to increase 3.5% in 2015. Organic chemicals, one of the most important segments of the French chemicals industry, grew 5.6% in 2014, mainly due to a rebound in the French automotive sector and robust demand from packaging, while demand from construction remained subdued. In 2015, production in this segment is expected to grow 1%. Specialty chemicals are expected to increase 1.3% in 2015 after registering 1.8% growth in 2014. Given that the chemicals sector´s export share (mainly in Europe) amounts to more than two thirds of overall sales, French businesses are in strong competition with other international players, especially with US chemicals businesses that benefit from lower energy prices. The current gains from lower oil prices are partly offset by this competition, as decreases in raw material prices have to be rapidly passed on to lower sales prices in order to maintain market shares. However, those lower sales prices for chemicals products should further stimulate demand and provide more financial flexibility for chemicals businesses as working capital requirements should deflate. The currently lower exchange rate of the euro against the dollar also helps French chemicals exporters for the time being. In the long term, the high level of investment in the US chemicals industry seen in recent years clearly provides the US competition with a strategic advantage against their French peers. Basic chemical products are most affected, as this segment’s profitability depends mainly on volumes, which makes it more sensitive to energy costs. On the contrary, the specialty chemicals segment maintains a competitive advantage as it is less price-sensitive, but depends on innovation. The danger of losing competitiveness has clearly led to some strategic restructuring measures by French chemicals businesses, such as focusing on core business activities and diversification of activities towards specific segments with higher margins (painting, ink, glue, herbal-pharmaceutical products, essential oil). In order to improve their margins, smaller companies continue to focus on niche markets, invest in research and development and develop additional services for technical support of customers. Despite growing competitive issues, businesses in the French chemicals sector generally show satisfying margins with good cash generation. The volume of protracted payments and non-payments is expected to remain low. 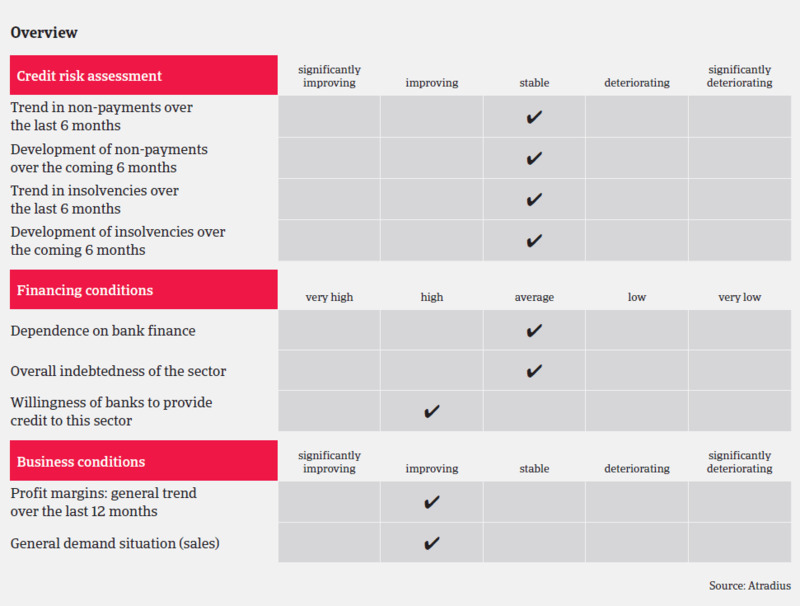 The industry is characterised by a low level of insolvencies. It is expected that the number of insolvencies will decrease further in 2015, although this decrease will probably be below 2%. However, given the value chain structure of the sector, insolvency of a major player would have a severe impact on suppliers. Due to the overall good performance and the low frequency and value of credit insurance claims, our underwriting approach is positive. That said, we scrutinize the refinery subsector more closely, which suffers from overcapacity in France and Europe. The French petroleum industry association UFIP estimates that the average refining margin was EUR 22/tonne in 2014, while variable and overhead expenses amounted to EUR 30/tonne, leading to large losses. 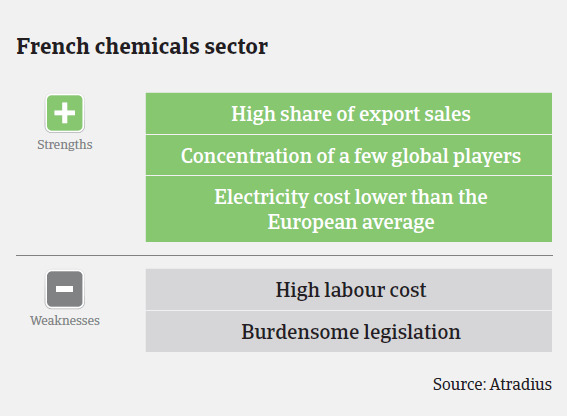 When underwriting chemicals businesses, it is also still important to identify end-markets (for instance the French construction sector as one of the major chemicals buyer industries still shows no comprehensive rebound).